Later deco Swedish chest of drawers, circa 1960. 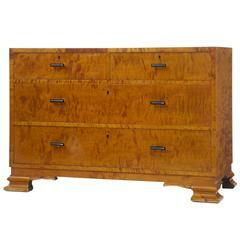 Three-drawer chest made from elm veneers. Original wood turned handles with elm root inlay to the front. Minor wear consistent with age.